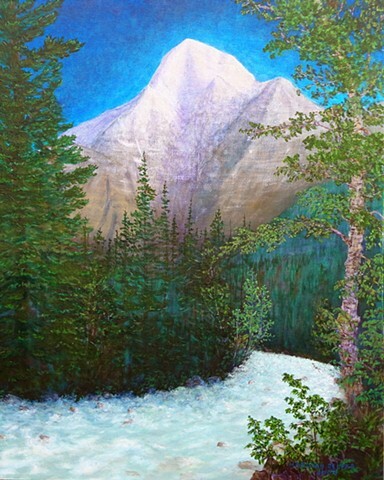 This is the view of Mount Robson on the trail to Kenney Lake. Mount Robson is the highest peak in the Canadian Rockies at 3954 metres and fortunately, when we were there, it was a bluebird day as the peak is often shrouded in clouds. The icy glacial waters of the Robson River makes the air cool along the trail. I painted the sky a cobalt blue to give the illusion of the peak reaching into the upper atmosphere.